Whitesnake‘s eponymous 1987 album bears the dual distinction of being the moment where a rock band finally reaches its full commercial promise and assures its own rapid demise. Both of these achievements could be placed on the lap of the group’s founder, lead vocalist, and all-powerful decision maker David Coverdale. The band was formed in 1978 and named after Coverdale’s first solo album after his short, mid-seventies gig as Deep Purple’s front man. Whitesnake had increasing success with its three previous albums released in 1980, 1982, and 1984 respectively before Coverdale decided to go “all in” with the next release. After the moderate success of the group’s latest album Slide It In, Coverdale teamed up with former Thin Lizzy guitarist John Sykes to compose new songs with a more aggressive, guitar-oriented sound. 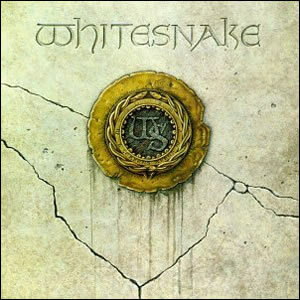 With the exception of two songs that were redone from the 1982 Saints and Sinners album, Sykes co-wrote every song on the the Whitesnake album, which had its release delayed for a year when Coverdale contracted a serious sinus infection which made recording nearly impossible. However, after Coverdale recovered and completed recording, he summarily dismissed Sykes from the band. The subsequent famous music videos would feature new guitarists Adrian Vandenberg and Vivian Campbell “miming” Sykes’ guitar parts. 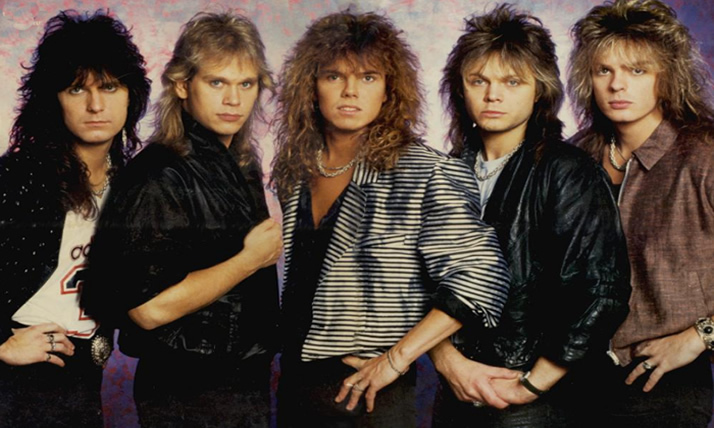 The band’s rhythm section faced a similar fate, as bassist Neil Murray and drummer Aynsley Dunbar were replaced with younger, more “video friendly” players post album release and keyboardist Don Airey was never considered part of the touring band. To complete the overall lack of integrity with this album, a different version entitled 1987 was released in Europe with a different running order and two extra tracks. The bluesy experience which made the album a good listen was discarded and leaving Coverdale in front of a hollowed out faux band to pretentiously soak in the fruits of the multi-year studio effort. The album was by far their most commercially successful and received exponential more radio play than all their previous efforts combined. However, it also alienated many of Whitesnake’s long-time and loyal fans, who viewed this 1987 album as a pander to the mainstream fads of the time. The album is best known for the MTV videos which featured actress Tawny Kitaen, Coverdale’s then-girlfriend who he later married. In spite of all the “style over substance” surrounding this album, it does contain some brilliant musical moments, a few of which where Coverdale does a great job channeling some classic-era Robert Plant. The opener “Crying in the Rain” was originally on Saints and Sinners, with this re-recorded version portraying a much heavier, Zeppelin-esque sound. “Still of the Night” is the true highlight of the album, with Sykes and Murray reworking an old demo by Coverdale and Ritchie Blackmore from the Deep Purple days over a decade earlier. The song combines the blues origins of the musicians with a crisper, updated, and harder-driving sound. Coverdale’s vocal call and response to the riffs are classic Page, Plant, and Jones and Dunbar’s hi-hat work during the mid section is pure Bonham, making this song the 1980s heir to classic Zeppelin. Coverdale would later join up with Jimmy Page for a few albums in the early 1990s. “Here I Go Again” was the second remake from Saints and Sinners, co-written by Whitesnake’s then-guitarist Bernie Marsden. It became a #1 hit for the band in America and the peak of their commercial appeal. It was also the point at which the band truly “jumped the shark” as the song was re-recorded yet another time for a watered-down “radio-mix” version, which took away absolutely any edge left on this originally fine composition. Much of the rest of the album is unremarkable and formulaic, with the power ballad “Is This Love” also making waves on pop radio. One standout is the closing “Don’t Turn Away”, which is a unique rocker reminiscent to some of the band’s better material on their previous album Slide it In. That last song leaves the listener with a taste of the Whitesnake’s prior potential which no longer existed even as the band was headlining arenas through 1988. More line-up changes would plague the band moving forward and even with the inclusion of top talent like Steve Vai, the band would never again reach the heights of 1987. White Snake was no more than an opening act before this album. Coverdale always got the best musicians to play with but the song writing was pretty boring. This album was really almost perfect from a song writing standpoint. Those who think they sold out are simply die hards for an outdated style of music that Coverdale refused to let go of until slide it in. This classic album is a perfect example of combining some really magnificent guitar driven compositions peppered in with some dynamic power ballads with the added related promotion of MTV to further boost to where it went in sales. The previous ‘Slide It In’ was another extraordinary album with a more bluesy style combined with Coverdale’s superb vocal range and delivery but this ’87 classic really pushed them up notches commercially.